Andy: This is a delicious rum. It has a spiciness up front and a nice little burn towards the back of my throat. Mixed with Diet Coke with Lime it really keeps its great rum flavor. if you like a strong rum taste, this is a great choice. 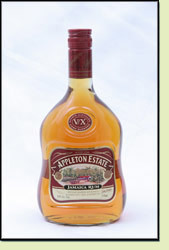 Adrian: Appleton Estate VX has a nice flavor, not at all harsh, a nice flavor, almost a little woodsey. Excellent with Diet Coke with Lime and easily found. This is a regular go-to rum in the house. Rating 4,8 out of 5.